Bangalore Monkey: through thatgayeway, evil will invade the word. I've always had a weakness for horror movies, ever since watching the Son of Svengoolie on channel 32 in Chicago. So it was an exciting surprise to visit the Landmark store in the Forum Mall a few days ago and see their wide selection of cheap and awful horror movies. Any guesses as to why I had to have this particular specimen? 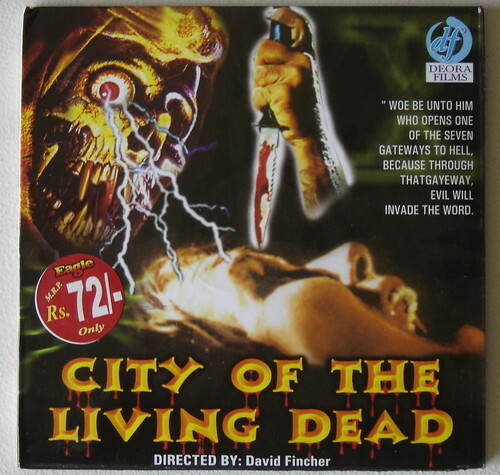 In my heart of hearts I knew that only in an alternate universe could there be a grade-Z horror movie "including" Meatloaf and Helena Bonham Carter and, er, "Brad Fitt," but what if I'd tracked down a lost gem that IMDB had neglected to put on David "Se7en" Fincher's directorial resume? Anyway, I haven't watched much of this movie -- too scary! But I've seen enough to say that Jared Leto et al. 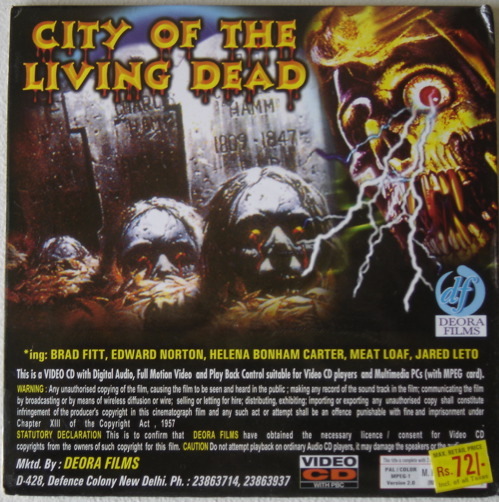 don't appear in a movie that sounds much classier when it's called Paura nella città dei morti viventi.